Partners In Leadership, LLC, introduces the Workplace Accountability Index, a new tool for organizational leaders. TEMECULA, Calif., September 24, 2018 – Partners In Leadership, LLC, the firm that guides clients in defining Key Results™, shaping Cultural Beliefs®, and solving Accountability Gaps, introduces the Workplace Accountability Index, a new tool for organizational leaders to measure a company’s ability to respond and handle change, solve problems, and ultimately produce results. In the Forbes Insights and Gap article “International Challenge or Be Challenged,” 70% of global leaders shared they were concerned their company may not be relevant and competitive in two years. In the “Global State of Strategy and Leadership Survey” from Palladium Group, 72% of executives responded they believed their business model will be under threat in the next five years. 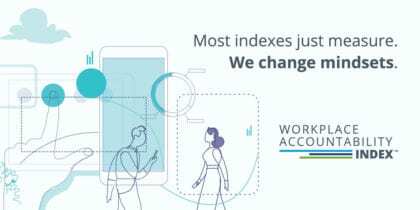 The Workplace Accountability Index is grounded in the firm’s 30 years of experience consulting the world’s leading organizations in corporate culture management. It evolved from The Workplace Accountability Study, which examined the state of accountability in organizational workforces. Over 40,000 people, from the executive suite to frontline leaders, participated in the 2014 Workplace Accountability Study, providing unprecedented scope. Subsequent statistical analysis discovered correlations to employee engagement, agility, growth, and results. The Index doesn’t measure employee engagement. It interprets it. Specifically, it measures: feedback seeking, psychological ownership, creative problem-solving, and taking effective action. Partners In Leadership is offering a baseline survey, analysis, and report with a limited time offer for 2018.